As the evenings start getting darker sooner and the outdoor chores requiring less time, I bet I'm not alone as I find comfort in turning my summer sandles for winter slippers and sipping tea after a long day of work. And after almost a week of not even being in my sewing room and suddenly finding myself in creative withdrawals, I thought I'd join Kate's 15 Minutes to Stitch Challenge from now to the end of the year...to get myself into a Winter sewing routine. I've got a lot of "ToDo" projects done and delivered...so tackle this challenge with a sense of quilty freedom to just sit down and play with my sewing. Curious how you find time for your quilty habit? Comment or even better, stop by Kate's linky and share. I do find the time everyday. I do it by always having many projects going at one time. So I may sit at the machine, sort fabric for a project or simply do some hand work. Sooner or later things do get done. Enjoy your stitching time! If I'm in the mood for sewing I can stay in my workroom until 3 in the morning. If I stay home I get to sew. If I get in my car I don't get home til tea time and then I am worn out and sit and blog read. This is such a wonderful idea and something I have subscribed to for years. I try to stitch at work during my lunch break... or (and more frequently) at night while watching TV. Sometimes I don't get a lot done and fall asleep with a needle in my hand... but every stitch counts! Stitching every day keeps me sane! Being newly retired, I have to admit (somewhat gleefully, I appologize) that I no longer have that problem! I always keep a little kit of hand sewing at the ready so if I am out and about (say to the dentist or doctor) I can grab the bag and do a little sewing while I wait. It is also great for those evenings when I don't know what I want to do. I can just grab the kit and do some hand work! I recently joined a quilting group that meets two Thursdays a month and I decided/decreed that any Thursday the group doesn't meet will be spent in the sewing room as if I were out of the house. So from 6 PM on, Dad's in charge of the kids & dinner, and Mom's off duty! The problem with going into the sewing room in the evening, of course, is I don't want to leave it and I stay up too late! But still, it's a good start. I'd like to spend a bit of time in the sewing room each day, but generally when I go in there, I don't want to leave and then a lot of other things don't get done. So it might be better for me to plan one day a week like, "this week, as soon as the kids are off to school, Tuesday is quilting day!" I have a volunteer commitment three partial days a week from May through October, so I'm looking forward to when that ends this year -- surely I can get more quilting in when I get that time back! 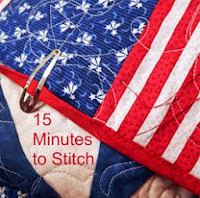 I think that, that is a wonderful idea, because we all know that if we sit down to sew for 15 minutes, that 15 will turn into an hour at the blink of an eye. It's a great way to our minds to gear down from summer chores to winter pleasures. I am one of the fortunate ones to be able to say that I am retired and lately I have had several hours for sewing. I just finished my first quilt of the season:) When I'm finished typing this I am going to hit the follow button and I hope that you will visit me and do the same. I love meeting sister bloggers with common interests. It does give you the drive to just get on with it. Making it to the sewing room after being at work all day is my biggest challenge, once I'm there I don't want to leave. Thanks for linking up and for spreading the word about the challenge. I gave myself a similar challenge with that cross stitich pattern! But that black Aida cloth is a challenge now that the nights are getting longer! It feels a lot like when I was doing a corespondence course! Once you get down to it, in the flow, the time seems to fly by!